Back in the early 90s if you had asked me what I thought of the police I would have told they were an instrument of oppression of an uncaring, authoritarian, right wing government. Well I have grown up a a bit since then and maybe The Met has changed too. Sure all the collusion between The Force and News International is a blot on their copybook, but for the most part I sense that the relationship between the bobby on the beat and the people they protect has changed considerably. It has been a long and slow process and along the way terrible mistakes have been made. But I hope that most people today think of the police as good people with a tricky job to do, rather than pawns used by the government to keep us all, and especially minorities, in check. Ok, so much of this stems from personal experience. A couple of decades ago the police in my part of town, N16, were seen by some locals as lazy, corrupt and racist. Very few people think those things now. Most of my dealing with the police have been hugely positive. I have nothing but praise for our community police team. I do think that many people’s suspicion of the police used to be fuelled by car ownership – getting nicked for speeding etc. However as car ownership in the capital has declined I wonder if this has made Londoners less wary of the police. Ok, so it might be a different story in Tottenham and the Mark Duggan incident is obviously a complex and tragic story, but one terrible mistake shouldn’t tar a whole group of individuals. So if one small good thing has come out the riots it is that communities have once again seen the police as a force for protecting them. Sure, on the early nights of the riot, with numbers stretched to the limit, the police struggled. But also I think people recognise that many officers went way beyond the call of duty, often putting themselves in very difficult situations. So I love the idea of this buy a bobby a beer Facebook group. Well until I get nicked for riding my bike on the pavement that is. Finally though it is worth retweeting fellow N16 resident Yvette Cooper’s tweet from this morning. Is Bantr going to be the Twitter for footy fans? Funnily enough while I was watching the Charity Shield it suddenly struck me that a Twitter for footy fans would be a great idea. Non football fans could then avoid endless transfer tweets while lovers of the beautiful game could indulge in tactical chats without worrying about annoying their followers. And then today I hear about bantr.tv – a social network for footy fans. It looks fun – if a little over-complex – and hopefully it will do well. The fundamental problem it faces though is that we are all so wedded to Twitter that adopting another platform would be a bit of a leap. Maybe there is a way of using hash tags to organise tweets – the tricky bit would be directing them away from non-appreciative followers. Btw the pic is Arsenal’s ace new winger Alex Oxlade Chamberlain . I have been a bit of a fan of playwright Murray Watts for a while now. His exploration of the impact of Charles Darwin’s work on his Christian faith in Mr Darwin’s Tree – was quite superb in the way it handled a very controversial topic with sensitivity and lightness. There’s a lot of silliness this morning about how last night’s London riots were not caused by opportunist chavs bent on smashing things up and getting a very good deal on a new pair of Reeboks. But is it actually Twitter’s fault. The theory is that otherwise law abiding individuals heard all about the fun on the riot hashtag and suddenly morphed into anarchists bent on causing chaos in north (and a bit of south) London. But why should the buck stop with Twitter – here are three other reasons why we saw widespread rioting last night. 1 Blackberrys – I was actually going to do a jokey post about the way in which QWERTY keyboard phones have made it so much easier for wannabe rioters to keep themselves organised. But then this lot beat me to it http://urbanmashup.wordpress.com/2011/08/07/the-unlikely-social-network-fuell… with a detailed examination of how Blackberry’s messenger system BBM was used by some of those rioting in Tottenham. ‘BBM as it is known, is an instant messenger system that has become popular for three main reasons: it’s fast (naturally), it’s virtually free, and unlike Twitter or Facebook, it’s private. So what has all this got to do with the riots in Tottenham? Blackberrys do appear to be the smartphone of choice of a certain kind of individual and it won’t be too long before the Daily Mail are calling these the BlackBerry Riots. 2 Flashmobs – Another tech innovation that certainly inspired the rioters last night. Obviously influenced by high profile flashmobs – mobile phone companies and the producers of the second St Trinians film hang your head in shame – north London’s youngster’s simply recreated a few ads with a side of shoplifting. 3 Morrissey – I can’t believe that no one has mentioned this yet. Last night Moz played Brixton Academy and finished a blistering set with a powerful high octane version of The Smiths’ classic Meat Is Murder. Within an hour or so KFC/McDonalds and Nandos had been wrecked. Are the two connected? Should we really be calling the Brixton disturbances the Vegan Riots? Were Smiths fans driven into a frenzy by images of slaughtered cattle responsible. So blame tech companies, musicians and whoever else you like. 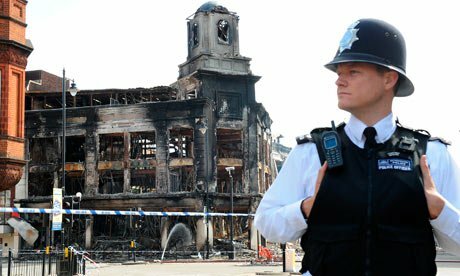 The riots had nothing to do with people in poorer parts of London deciding to help themselves to a few freebies did it? It had nothing to do with poverty and greed did it?